The natural ridge dividing the Garden along its length is traversed by a trail named after the numerous rock hyraxes (dassies) found in the area. Starting at the waterfall near the Tea Garden, the Dassie Trail follows a series of paved pathways through the natural Bankenveld vegetation, along the spine of the ridge. 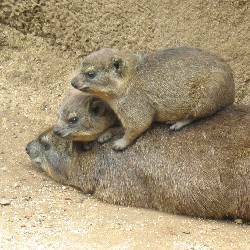 The rock hyrax thrive in this environment and are often seen basking in the sun. Trees carrying edible fruit such as the wild apricot (Ancylobotrys capensis) and the unusual stamvrug (Englerophytum magalismontanum) grow naturally in this area. Route markers, numbered viewpoints and numerous benches along the trail make this hour-long walk a must for the keen nature lover. A Dassie Trail Guidebook with interesting information about plants on the route can be bought at the main entrance gate or at the SANBI bookshop.